As summer and autumn sea ice diminishes in the Arctic Sea, polar bears spending more time on shore have been spotted eating eggs, hunting down the nesting birds that lay them, hunting other land animals and even chewing on edible plants growing onshore. But is that enough to sustain them in an ice-scarce Arctic? No, says a new study. As summer and autumn sea ice diminishes in the Arctic Sea, polar bears spending more time on shore have been spotted eating eggs, hunting down the nesting birds that lay them, hunting other land animals and even chewing on edible plants growing onshore. But is that enough to sustain them in an ice-scarce Arctic? No, says a new study by scientists from the U.S. Geological Survey, Washington State University and Polar Bears International. 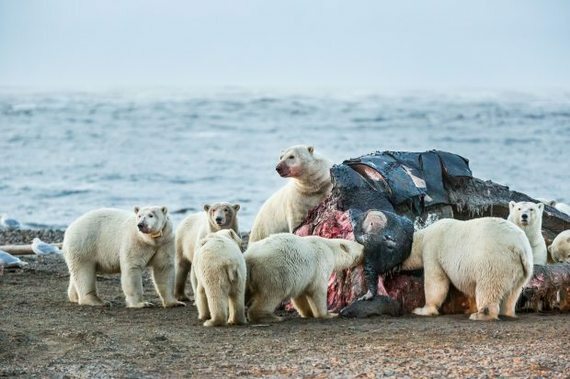 The study analyzes the food needs of polar bears, including their genetic metabolic characteristics and the characteristics of the onshore ecosystems and the foods in them. The verdict? Terrestrial foods are, for the most part, the wrong kind for fat-dependent polar bears, and there is too little of them. What bear food does exist on land is already being used by Arctic grizzly bears, which -- appropriately -- are the smallest and most spread out of all the world's brown bears, said the study's lead author, USGS research biologist Karyn Rode.